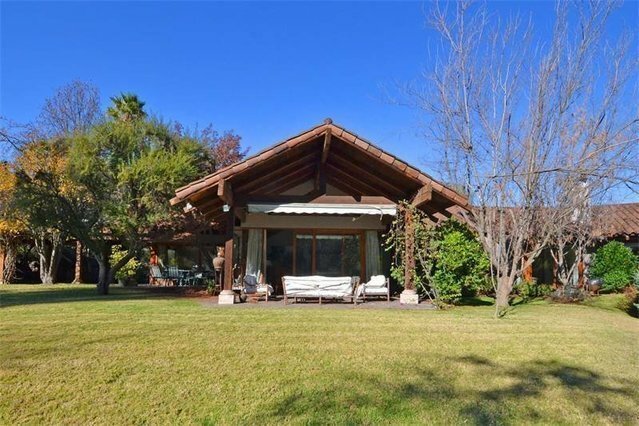 Spectacular house located in Lo Curro with more than 5,000 m2.Large main entrance with guest bathroom, built in bar, double height living room with access to a cozy terrace from where you can enjoy a beautiful view of the garden and the city of Santiago. Spacious dining room from where you have access to a second terrace and a large roofed barbecue area that overlooks the pool. Kitchen with dining room, service area, two service pieces, boiler room and bathroom for the gardener.Master bedroom in suite with double height and floor to ceiling windows that allow you to enjoy the spectacular surroundings, in addition to a nice terrace from where you can access to the garden. Master bathroom with jacuzzi and walking closet. Two bright bedrooms that share a bathroom and a great family room. In the below floor there are two more bedrooms, two bathrooms and a large room, which can be used as a workshop.